Who needs a new library in downtown San Diego? Today, the city of San Diego has broken ground on a $185-million public library: what an astonishing waste of money! If you’re one of those whose immediate response is, “I use the library all the time, as do many others,” let me explain my apparent blasphemy. Although I’m appalled by the prospect of a new central library in downtown San Diego, I’m not against libraries as such. I’ve been a card carrying member of several libraries since I was about 5. 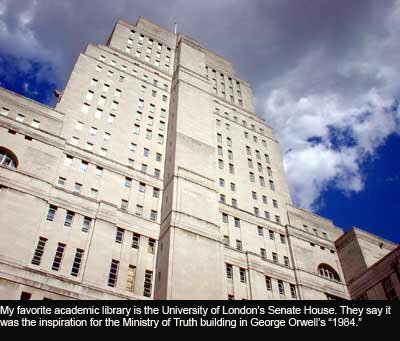 But that was back in the UK and, in the consensus politics of the early 1960s, British libraries functioned as an idealist bureaucracy for the provision of books, all books, any books. Did we need public libraries? We needed them absolutely. Free access to books was high up in the post-war British working people’s unwritten bill of rights. You could step up to the counter and ask for “The Ship Aground” by C. Fox Smith and, if they didn’t have it, they’d have it rushed in from the nearest branch that did have it. And, if no branch had it, they’d buy a new copy just so you could borrow it. Of course all this changed in the cold reality of the 1980s, when local governments, the whole world over, had to cut spending. The librarians were at the mercy of the accountants. And what do they know of keeping books, whom only bookkeeping know? It seemed to make good business sense to break up all the valuable collections and sell them off for cash. After all, a book that isn’t requested from one year’s end to the next clearly doesn’t justify its shelf space. And, with the proceeds, every branch could purchase the complete works of Tom Clancy in hardback. And that’s the problem with the business model. By offering the books most requested by most customers, the library actually stops being a worthwhile library. And by worthwhile library, I mean an organization that will provide any book you need, no matter where your research may take you. And why should the elitist demands of obscure academics be furnished from the public purse? 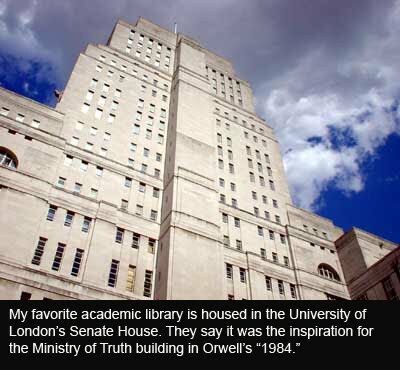 Don’t the universities have academic libraries? Well, some do. And that’s very helpful for those who qualify for a reader’s card or can afford the subscription. For the rest of us, there’s the public library, now ghettoized into artificial categories such as “Lesbian & Gay Literature,” “African American Studies” because some bureaucrat once thought this would make James Baldwin more accessible to minorities. I don’t read as many books now as I did in my youth. I remember a summer vacation when I read fully 12 books in a week, requiring my mother to drive me back to the library twice, because my ticket only allowed me to borrow four at a time. I used to stroll around the library and browse, coming out with fascinating works that happened to call out to me from the shelf, or the stack. I don’t have that sort of time on my hands now. And there’s no long line at the returns counter nowadays, so I don’t think I’m unusual in that respect. Are we staying away from the existing libraries because we need a bigger one? There are still times when I need a specific book immediately. So what do I do? 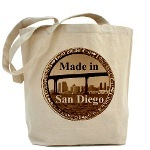 I access the catalogs of the county library and the city library by means of the Internet, I reserve the book online, and then drive over to La Mesa, La Jolla or wherever to pick it up. But I have to telephone in advance in case the branch is closed. The financial straits of the new millennium have forced closures and sabbaticals to save on wages. San Diego can’t even afford to run the libraries we already have. Very occasionally, I have had to venture downtown through the very beautiful art deco portals of San Diego’s central library to pick up my book. But I used to spend a lot of time there, about ten years ago when I first moved to San Diego. I was particularly fond of the “Humor” section, where I found the forgotten works of S. J. Perelman, James Thurber, Stephen Leacock and Art Buchwald, apparently unopened and undusted since the 1950s. If I don’t need a specific book immediately, I go online and check Amazon.com for used copies. Somebody will be offering a fair copy of what I need for around five bucks and it will arrive within about three days: much better value than a Netflix account. The world has changed. Public libraries have changed. Now they’re designed to facilitate easy Internet use rather than printed matter. The knee-jerk assumption that the low-paid masses deserve subsidized access to literature should be re-examined. Even the unemployed have some kind of access to computers in Southern California and we can expect the cost to come down more rapidly than the new downtown library goes up. They say it will be fully built by 2013, by which time every child in San Diego will probably possess his or her own Kindle. Is the $185-million price tag justified? Hell, no. They even had to throw in a charter high school. Who asked for another school when budget constraints mean we can’t afford to pay teachers in the schools we already have? Having said all that, Los Angeles has a really great downtown public library. I had occasion to kill a few hours there a while back and I was impressed by the comprehensive collection of books. And, when I needed a wi-fi connection for my computer, there were about 25 to choose from. But I couldn’t help noticing it was named the Richard Riordan Central Library. After which great civic benefactor will San Diego’s magnificent monument to literacy be named? Is that it? San Diego has been developing its plans for a new downtown library for 30 years, during which time, every mayor since Pete Wilson has, in vain, imagined his name over the transom. And, despite the potholed streets, the undermanned police department and the dilapidated sewers, we’re going to spend the $185 million for whatever amenities our politicians need to stuff under the “iconic” dome.